Not so much, though serious challenges await China in coming years. First, China’s economic slowdown should be understood from a comparative perspective, both horizontally and vertically. This means that we should compare China’s economic performance with other major economies’ performance (in horizontal terms), but also that we should compare today’s Chinese economy with its own past (in vertical terms). Once we do this, it becomes very clear that in comparison to the European Union’s and Japan’s economy, the Chinese economy is doing just fine. Yes, it is true that China’s GDP growth might slip below 7 percent this year, and might even reach 6 percent in the next two years. But is this a bad number? How about Japan’s zero percent growth and the EU’s one percent growth? Granted, China is still in a developing stage and thus needs a faster growth rate to sustain its labor growth and rising expectations from its citizens. But still, a 6 or 7 percent growth rate would be just fine for China to transform itself into a high-quality economy. Moreover, the current slowdown of China’s economy is not a surprise at all. Most economists in China long ago argued that 10 percent GDP growth was not sustainable and actually harmful to China’s environment and future growth. Second, one main reason why the whole world is so interested in China’s economy are the potential social and political implications of a possible economic crisis in China. There are some theories out there that claim that an economic crisis usually leads to social and political instability and even transformation. When applied to China, however, such theories might not work very well. The reason is simple: there is no direct connection between economic crisis and political transformation. Too many variables come in between crisis and transformation. 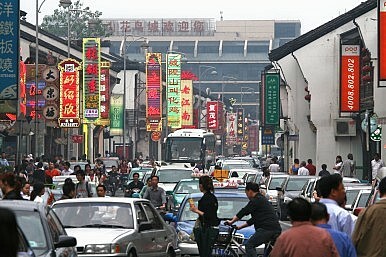 Those who hope for a transformed China after the economic crisis are bound to be disappointed. The overall social and political situation in China is stable, despite some occasional episodes of instability. The most recent Tianjin explosion, for example, has brought down dozens of high-level officials, once again demonstrating the Chinese government’s will and determination in responding to social voices. Of course, there is much more to do in this area, but the central government is mostly doing the right thing. Third, the most fundamental question facing China’s economy and its future is how far and deep its reforms can go. It is evident today that all across China, reform proposals are facing strong resistance from all sorts of bureaucrats. Vested interests are fighting hard to retain their fortunes and we can only expect an intensification of anti-corruption efforts in the future, particularly in the financial area which is beginning to be scrutinized by Wang Qishan’s Central Commission for Discipline Inspection. This is the key battle that we need to watch closely today. To conclude, it is right for the whole world to watch China’s stock market and economic slowdown, but there are more important things to keep in mind besides the stock market. Nobody says China’s reforms will be easy and there is certainly a consensus among Chinese officials and scholars now that something serious needs to be done to bolster China’s economic structure. We may soon witness bold reforms by the Chinese government. This is because they are necessary.